— Ulises Carrión, “The New Art of Making Books” (1980) 1 1 Ulises Carrión, “The New Art of Making Books,” Artists’ Books: A Critical Anthology and Sourcebook (Peregrine Smith Books/VSW: New York, 1985), 42. It began with a desire to touch the thing itself. All scholars are attached to books, of course; some are lucky enough to have shelf space in offices or homes to contain their collections. At the same time, I have adjusted my own work habits over the years to accommodate, for better and for worse, the increasingly digitized workflow of academic life. While the research for my first book – photocopies from archives, museums and libraries – occupied a couple of long shelves in a filing cabinet, research from the second was mostly stored in nested folders on my hard drive. This time, however, I am writing about materiality, about the book as an object, and the intersection between literature and things. So it makes sense that I would want hand-on-book contact. I believed there was something essential to be learned through the haptic experience of encountering the book itself. Fortunately, the books I was most wanting to hold – Hebrew and Yiddish literary journals from the interwar period, yizkor books produced on three different continents, artists’ books from Jerusalem – were more or less available to me; some required an appointment to view, but most could be handled (carefully, and without gloves! ), sniffed, and scanned for future perusal. Filling out my dance card were Google Books, Haithi Trust and digital archive projects from libraries in Palo Alto and Oxford. 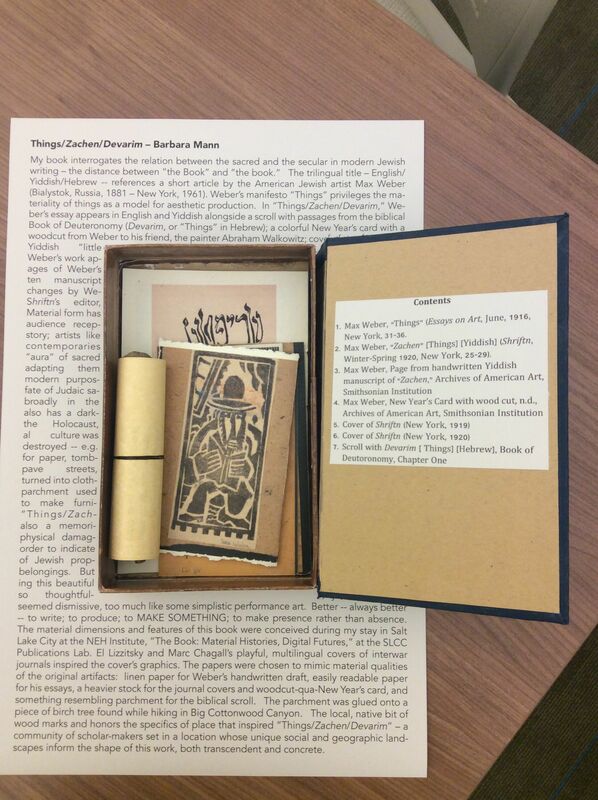 Ultimately, I acquired a remarkable virtual library of early- to mid-twentieth century Jewish cultural expression. And yet, the more I worked, the more libraries I visited, and hundreds (thousands?) of scans and other digital files later…. I had still not satisfied my need for the book itself. More than just holding books, I began to understand, I wanted to know how they came into the world; I wanted to appreciate the materials and processes of their production. That knowledge could only be gained through a different set of experiences, one that involved a hands-on encounter with the materials of print. It was not enough to write a book; I needed to make one as well. 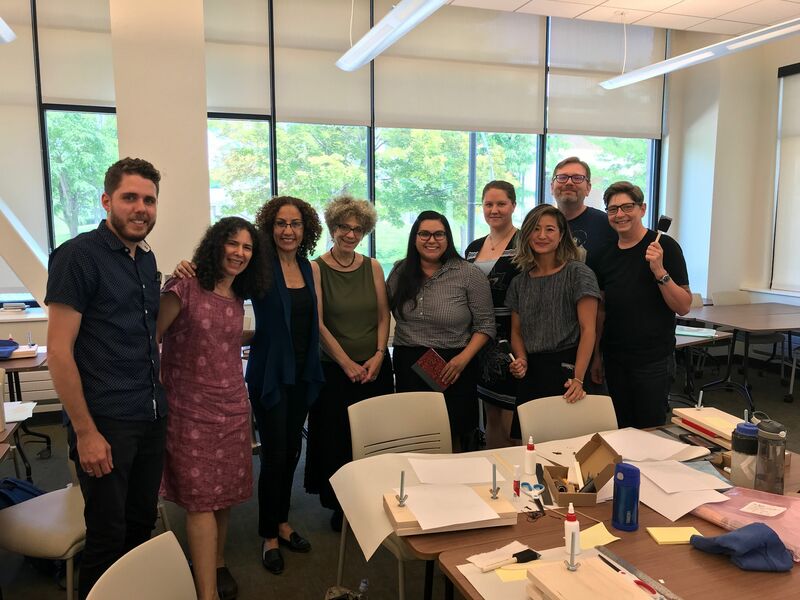 I created the artist’s book “Things/Zachen/Devarim” over the course of a month-long immersive NEH Summer Institute – “The Book: Material Histories, Digital Futures” – hosted in 2018 by the Salt Lake Community College Publication Center. 2 2 I am indebted to the amazing host-organizers of the NEH Institute at Salt Lake Community College — Lisa Bickmore, Melissa Helquist and Charlotte Howe – for their expertise, generosity and creativity, and to all the Institute fellows for their collegiality and collaborative spirit. For more particulars about the Institute see https://saltlakecommunitycollege.blogspot.com/2018/09/slcc-hosts-visiting-faculty-during.html?fbclid=IwAR00X0X39bUkVYTVNpxvqNTLFjbrHpoVf3ja-NdJx-cWqhA7HpuuICNtGY0 The artist’s book is a capacious genre, entailing both mass-produced “democratic multiples” (Johanna Drucker) 3 3 See Johanna Drucker, The Century of Artists’ Books (Granary Books: New York, 2004 ), especially chapter 4. and one-of-a-kind objects made from expensive paper and luxurious bindings. 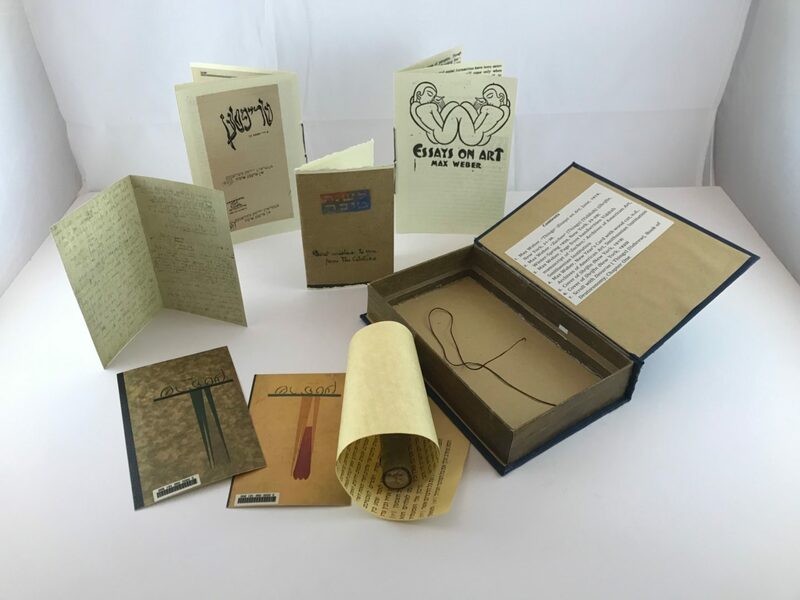 Emerging in the United States and Europe in the 1960s and 70s, often in opposition to more traditional venues like museums, galleries, and publishing houses, the artist’s book may be politically provocative, or merely beautiful. It is a descendant, in some respects, of prewar modernist experimentation with image and text; like those earlier publications, the boundary between these categories is often blurred, even exploded. At the same time, the artist’s book’s express status as a made object also ties it to older iterations of the book, especially the scroll or early codex produced on vellum or parchment, whose material presence conjured religious belief, social status, or economic value (and often all three). What then distinguishes the artist’s book as genre? It is this: the artist’s book, more than both its modern and pre-modern predecessors, most concretely and persistently demands attention to the book-qua-book. That is, whatever other features it may or may not possess, an artist’s book must always, in some fashion, interrogate its properties as a book. This interrogation can address modes considered to be the book’s universal formats (e.g. clay tablet to papyrus to scroll to codex to screen), or be more particularly drawn, shaped by the trajectory of the book and its meaning as vehicle of human expression in a specific cultural, national, or religious context. Culture will come only when every man will know how to address himself to the inanimate simple things of life. A pot, a cup, a piece of calico, a chair, a mantel, a frame, the binding of a book, the trimming of a dress…. these we live with. Culture will come when people touch things with love and see them with a penetrating eye. 6 6 Weber, “Things,” 32. This homage to the thing itself is of course a common refrain within modernist writing, from Williams’ “no ideas but in things” to Rilke’s “Dinggedichte.” Devotion to objects and the potentially material qualities of language also marked the early 20th century work of Hebrew- and Yiddish-language poets such as David Fogel and Anna Margolin. 7 7 For what I have called “Jewish Imagism,” see my “Visions of Jewish Modernism,” Modernism/Modernity 13:4 (2006): 673-699. For Margolin’s work in particular see my teacher resource kit. Some of Weber’s poems seem to respond to his aspirational call for attention to “the inanimate simple things of life.” For example, “My Kitchen” expressly focuses on domestic life (“My kitchen, my kitchen, — my palace, my tea room… Pots, and knives, and forks and places/All of humble make” 8 8Cubist Poems 43, Shriftn (Winter-Spring 1920), 17. ). 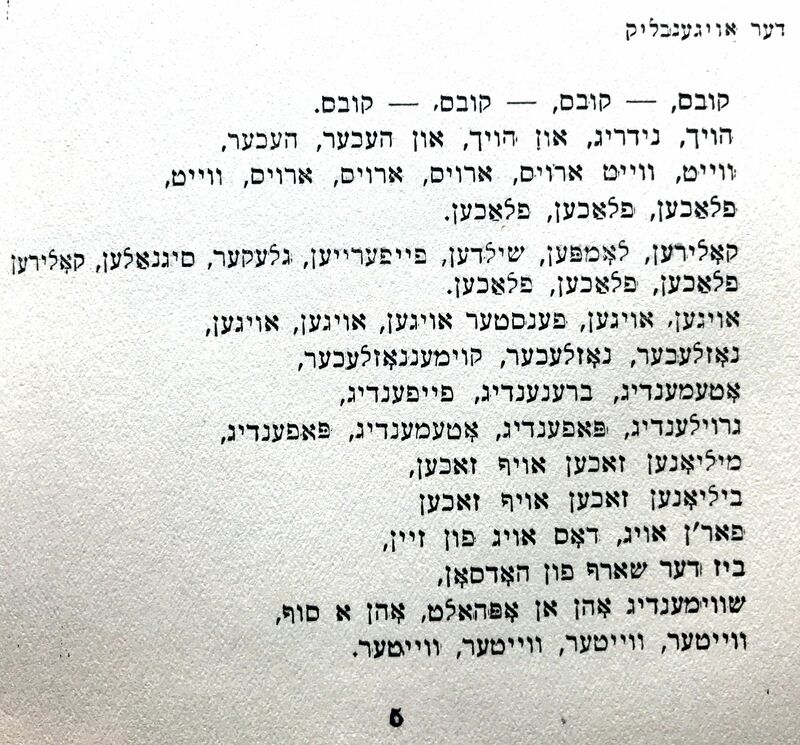 Another poem, “The Eye Moment” — (or in a much better Yiddish version: Der Oygenblick [Blink of an eye] — references the physical work of visual composition, in which geometric shapes are juxtaposed and cohere within a single glance: “CUBES, cubes, cubes, cubes…..” The poem’s words pile up on one another, and the Yiddish version of the poem uses the word “kub” with an English plural ending (e.g. instead of anticipated kuben, we get kubs). 9 9Cubist Poems 11, Shriftn (Fall 1919), 5. The line’s typography – with the block letters themselves forming squares on the page — deftly alludes to the iconic properties of text, in two possible languages, two different alphabets, English and Yiddish. Admittedly, for the most part Weber’s poems don’t really have much energy as poems, and in fact display little “love” for the humble, material fragments he lists in his essay. 10 10 In the preface to Primitives, the American critic Benjamin de Casseres calls Weber a “veritable primitive” and a “reaction against intellectualism.” Both poems and prints seem to fit that definition. Primitives: Poems and Woodcuts (New York: The Spiral Press, 1926), n.p. And yet, my frame of the artist’s book allows us to gather these artifacts – poems, manifesto, woodcuts, along with a clutch of other documents — to examine the role of “things” in Weber’s work, and in Jewish modernism more broadly. 11 11 See my “’Good to think with’: The Work of Objects in Three Novels of Modern Jewish Life,” Comparative Literature 70:4 (2018): 444-465. An encounter with “Things/Zachen/Devarim” asks readers to reconsider the notion of what constitutes a book, and specifically how material traces of sacred forms endure in ostensibly secular genres. Through the artist’s book, the “aura” of premodern forms may be transfigured anew in relation to a decidedly contemporary nexus of text, image, and object. 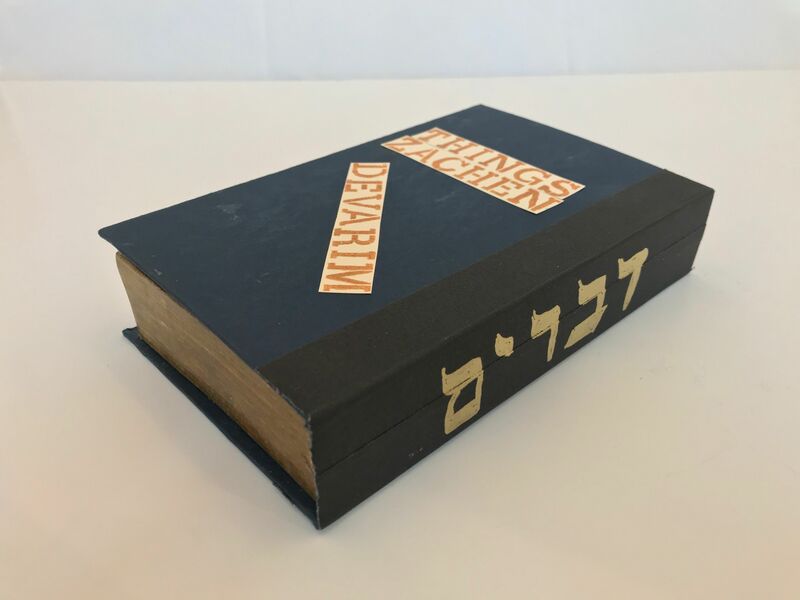 In “Things/Zachen/Devarim,” the book is a box: in Adrian Piper’s terms, “a thing that contains other things.” 12 12 Adrian Piper, Book Was There: Reading in Electronic Times (University of Chicago: Chicago, 2012), 11. It is covered with dark blue textured paper and bound with strong, leather-like tape; the Hebrew title, דברים (both “words” and “things”) alludes to the biblical Book of Deuteronomy, and was hand-lettered on the spine in gold, mimicking this feature of an illuminated manuscript. El Lissitzky and Marc Chagall’s playful, multilingual covers of interwar Yiddish journals inspired the cover’s graphics, their stenciled letters set on a diagonal. Inside the box, Weber’s full essay in English and Yiddish appears, bound in two separate booklets and nested alongside a group of other artifacts: reproductions of Shriftn covers; images of Weber’s original handwritten manuscript in Yiddish from the Archives of American Art at the Smithsonian, with penciled alterations (perhaps by Weber’s friend — and Shriftn’s editor – David Ignatoff); 13 13 The handwritten draft was included in the same file in Max Weber’s papers at the Archives of American Art, Smithsonian Institution, together with some poems and several envelopes and letters in Yiddish from Ignatoff addressed to Weber, hence my best guess that the former was also the anonymous editor. I did not include the correspondence I reference in my artist’s book. a colorful New Year’s card with a woodcut from “the Webers” to the painter Abraham Walkowitz; 14 14 Record number (DSI-AAA) 10270 from the Abraham Walkowitz Papers, Archives of American Art, Smithsonian Institution. 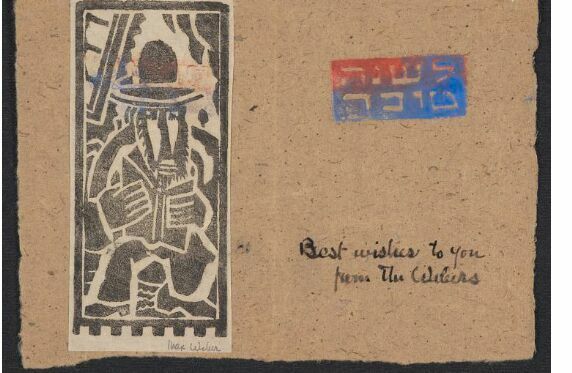 The card is listed as “date unknown.” However, there is another card from Weber, also in Walkowitz’s papers, dated 1934, using the same Hebrew letter print greeting. https://www.si.edu/sisearch/collection-images?edan… and a scroll with Hebrew passages from Deuteronomy. I chose materials for these artifacts whose physical qualities approximate those of the originals: linen paper for Weber’s handwritten draft, easily readable paper for his published essays, a heavier stock for the journal covers and woodcut-qua-New Year’s card, and something resembling parchment for the biblical scroll. The card, together with the Weber/Ignatoff correspondence, and the handwritten, corrected draft of “Zachen,” points towards the personal, often collaborative, relationships inhering in the production of early twentieth century art. Here, for example, Ignatoff shares this bit of encouragement in a 1921 letter to Weber: “Your last letter to me was written in a good Yiddish. However, your English glosses of certain words were at times completely unnecessary. I am certain that it would give you joy to write an essay in such good, plain Yiddish…. Weber, I am asking you, for your own sake, and as a friend: Send me an essay and a few poems in Yiddish. Write on the topic of: ‘What is criticism and what is a critic.’” 17 17 Letter from Ignatoff to Weber, dated 9/1/1921, from Weber’s papers at Archives of American Art, Smithsonian Institution. Ignatoff’s letter was written after “Zachen” appeared, and it remains unclear if his comments spurred Weber to write further. 18 18 For a discussion of the emergence of Jewish themes in Weber’s work see Matthew Baigell, “Max Weber’s Jewish Paintings,” American Jewish History, Vol. 88, No. 3 (September 2000), pp. 341-360. The Smithsonian folder, marked “Hebrew,” contains the handwritten Yiddish draft of Weber’s essay, in pencil, struck over and amended with what looks like a different hand (the lettering is a bit heavier), editing the original text. These documents challenge the idea of the lonely artist, a sole genius toiling away in isolation; instead, “Things/Zachen/Devarim” invites readers to consider the social, material conditions in which art was both made and consumed. Indeed, in her lively history of Di Yunge, Ruth Wisse describes Ignatoff’s memory of how Shriftn was produced: “when [he] had designed an issue of Shriftn containing reproductions of contemporary artwork, he asked the Yunge to devote an evening to gluing them in at the printer’s, since he had no money to pay for the job.” 19 19 Wisse, A Little Love in Big Manhattan, 99. I honor this collaborative and hands-on spirit by noting that my own artist’s book was conceived and produced within a community of scholars, set in the unique social and geographic landscape of Salt Lake City, Utah. My project’s artifact most expressly associated with pre-modern forms of religious practice and devotion — the scroll — is wrapped around a small piece of birch wood found while hiking in Salt Lake City’s Big Cottonwood Canyon, 20 20 With gratitude to Maeera Shreiber for both hiking and conversation. an allusion to both localness and the natural (though in this case, not animal) origins of parchment. Material form has always shaped audience reception of narrative and story; artists like Weber and his contemporaries capitalized on the “aura” of sacred texts, creatively adapting them for distinctively modern purposes. A twenty-first century scholar, who is also interested in the material side of things, may further probe the limits of the book’s form. 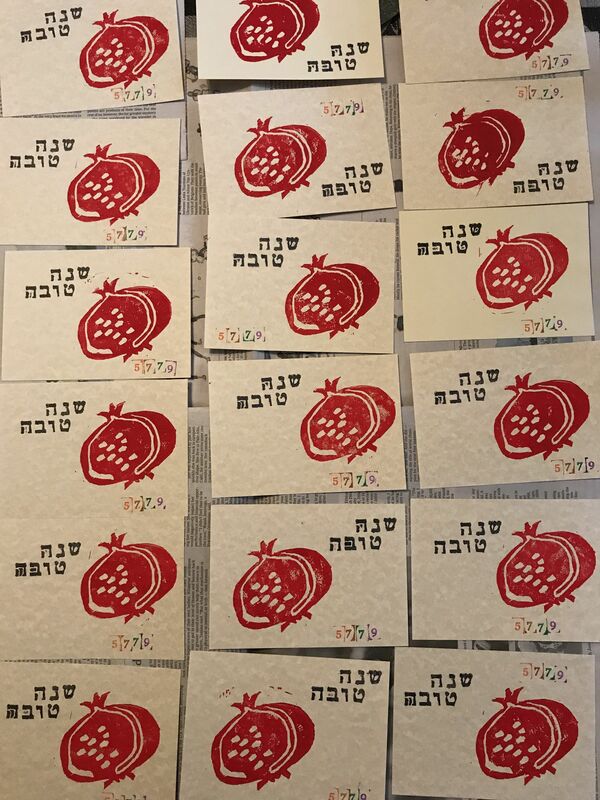 My artist’s book explores how materiality has both figured in and shaped Jewish writing, from the link between words and things, and the status of the scroll as an emblem of the divine, to modernist interventions such as Weber’s. Moreover, these connections are not presented in linear fashion (as in a traditional codex); rather, readers encounter them as a series of objects that may be handled and set in relation to one another, thus suggesting how each of these forms (letters, archival documents, little magazines), possesses its own embedded history of circulation and exchange. Jewish writing may therefore be appreciated as an integral part of Jewish material culture. 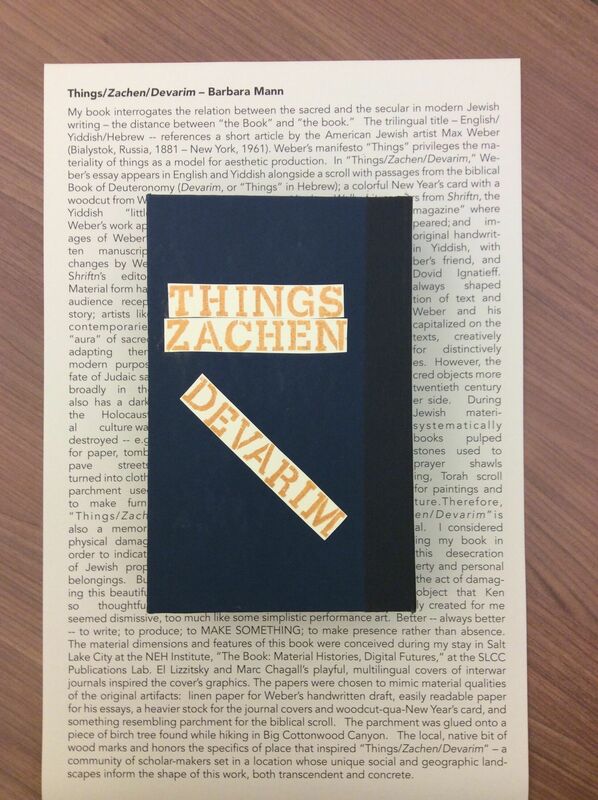 “Things/Zachen/Devarim” was presented along with other artist’s books from the NEH Institute in a group exhibit at the Salt Lake City Public Library. The beehive shaped construction, built in 2003, is a vital hub for cultural and community affairs; the exhibit itself was part of the public face of writing and publication activity in the city, especially within the diverse populations served by the community college system. The exhibit will travel to other institutions across the country. The process of creating my book was undoubtedly shaped by the collegial relationships formed during the immersive work of the Institute, and especially a cross-disciplinary commitment to “making” as an integral part of academic scholarship. Other projects drew on a variety of themes and bookmaking techniques, including Arduino-driven sound and light, Coptic stitch, leather covered boxes, Chinese calligraphy, letterpress printing, and case binding with various materials and papers. Each book is unique; together they represent hours of conversation and physical experimentation with the materials at hand. 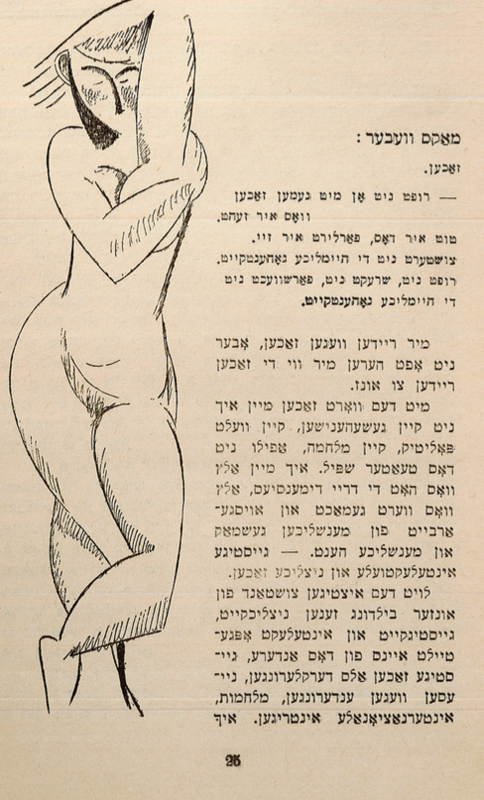 Since completing the book, emboldened and energized by both what I have learned and how I learned it, I have come up with another, somewhat more ambitious idea: “The Khalyastre Project.” I am creating facsimile reproductions of images from the journals I so admire – the Yiddish little magazines of Kiev, Lodz, Warsaw, and Berlin. 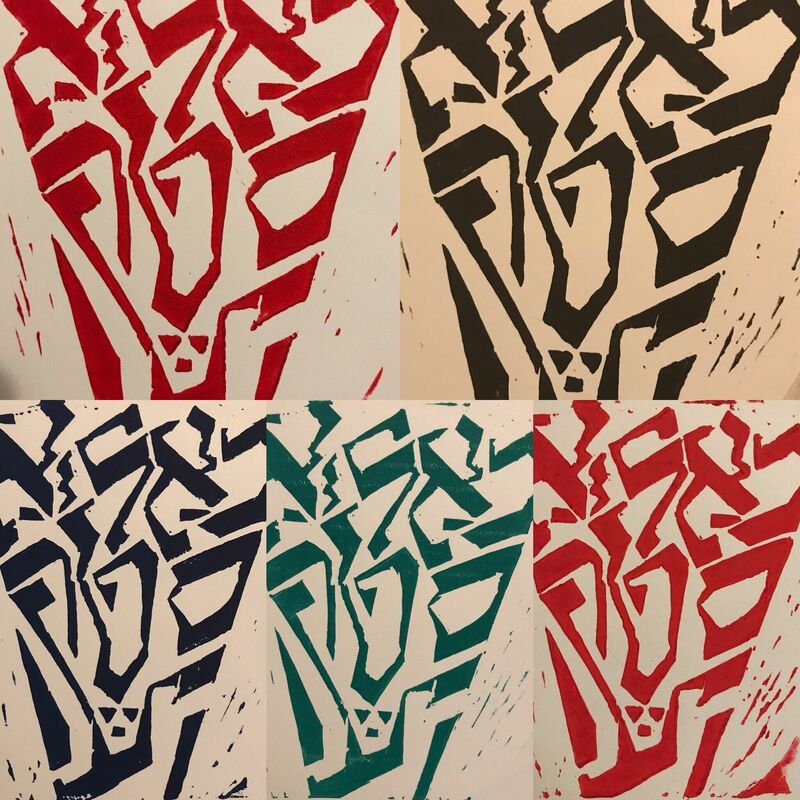 So far, after an initial series of linocuts made on my dining room table, I find myself both daunted and inspired by their herculean talents, and the boldness of their vision. Onward. To see more about Barbara Mann’s prints, bookmaking, and scholarship, visit her website here. With gratitude to Maeera Shreiber for both hiking and conversation. Adrian Piper, Book Was There: Reading in Electronic Times (University of Chicago: Chicago, 2012), 11. Wisse, A Little Love in Big Manhattan, 99. For a discussion of the emergence of Jewish themes in Weber’s work see Matthew Baigell, “Max Weber's Jewish Paintings,” American Jewish History, Vol. 88, No. 3 (September 2000), pp. 341-360. Letter from Ignatoff to Weber, dated 9/1/1921, from Weber’s papers at Archives of American Art, Smithsonian Institution. Benjamin Harshav mentions Weber’s prints and cites this evaluation from an art historian: “the reproductions in Shriftn, printed in black ink on off-white paper, were the exact size of the original prints and were characterized by a delicacy and fine clarity of line and form, particularly evident when compared with the later, flatter, and more heavily inked reproductions in Primitives (1926),” Daryl R. Rubenstein, Max Weber: A Catalogue Raisonne of his Graphic Work, University of Chicago Press, 1980), cited in Harshav, American Yiddish Poetry (Stanford UP: Palo Alto), 58-59. This evaluation is not borne out in the copy of Shriftn that I have. While the prints do appear less heavily inked in the earlier edition (Shriftn), the later works (Primitives) actually have a sharper sense of detail, with fewer extraneous lines: they are stronger prints. More interesting than the divergent judgments (e.g. which prints are “better”), we may note here how Weber’s print exists both as a unique artifact, with its own “aura,” and as part of a reproducible series. The handwritten draft was included in the same file in Max Weber’s papers at the Archives of American Art, Smithsonian Institution, together with some poems and several envelopes and letters in Yiddish from Ignatoff addressed to Weber, hence my best guess that the former was also the anonymous editor. I did not include the correspondence I reference in my artist’s book. See my “’Good to think with’: The Work of Objects in Three Novels of Modern Jewish Life,” Comparative Literature 70:4 (2018): 444-465. In the preface to Primitives, the American critic Benjamin de Casseres calls Weber a “veritable primitive” and a “reaction against intellectualism.” Both poems and prints seem to fit that definition. Primitives: Poems and Woodcuts (New York: The Spiral Press, 1926), n.p. Cubist Poems 11, Shriftn (Fall 1919), 5. 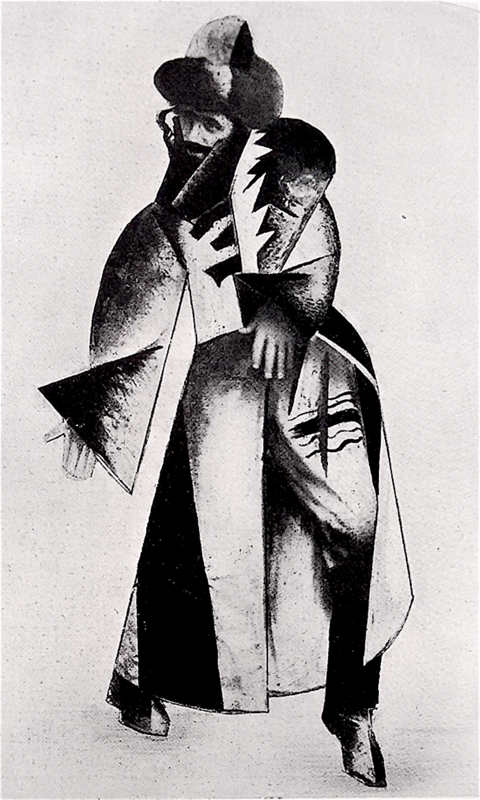 Cubist Poems 43, Shriftn (Winter-Spring 1920), 17. For what I have called “Jewish Imagism,” see my “Visions of Jewish Modernism,” Modernism/Modernity 13:4 (2006): 673-699. For Margolin’s work in particular see my teacher resource kit. Max Weber, “Things,” Essays on Art, (W. E. Rudge: New York, 1916), 31-36; “Zachen” [Things] [Yiddish], Shriftn (Winter-Spring 1920): 25-29. 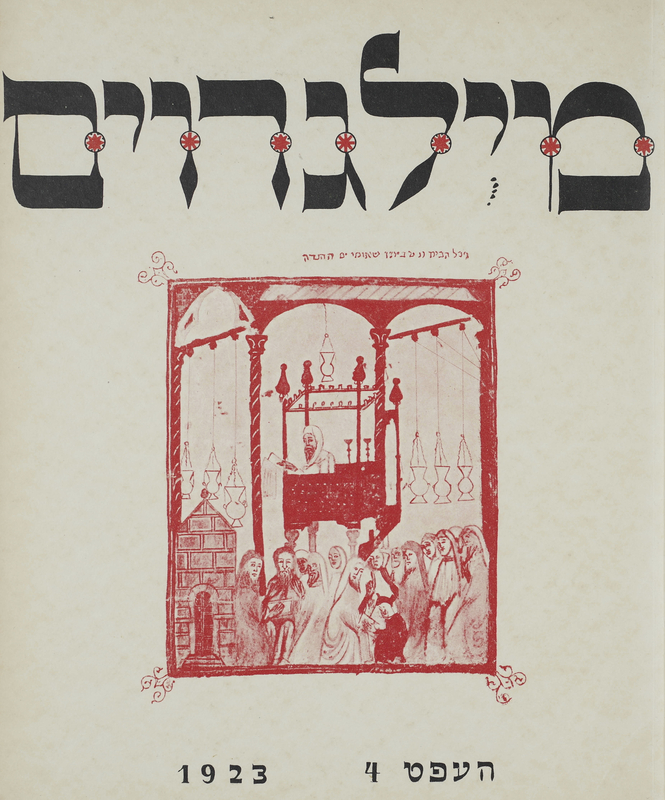 Shriftn was the house-organ of Di Yunge, the American Yiddish symbolist group loosely cohering around its editor David Ignatoff and poets such as Mani Leyb and Reuben Iceland. Published in an edition of 1,050 copies, this postwar issue was, according to Iceland, “no longer the organ of a coherent group,” but, he ruefully concludes, “perhaps, stronger in content and more beautiful in appearance.” Reuben Iceland, From Our Springtime (Syracuse, NY: Syracuse University Press, 2013), 111-112. See Johanna Drucker, The Century of Artists’ Books (Granary Books: New York, 2004 ), especially chapter 4. Ulises Carrión, “The New Art of Making Books,” Artists’ Books: A Critical Anthology and Sourcebook (Peregrine Smith Books/VSW: New York, 1985), 42. Mann, Barbara . “The Scholar and the Bookmaker: On Encountering the Material Side of Things.” In geveb, March 2019: https://ingeveb.org/blog/the-scholar-and-the-bookmaker. Mann, Barbara . “The Scholar and the Bookmaker: On Encountering the Material Side of Things.” In geveb (March 2019): Accessed Apr 20, 2019. 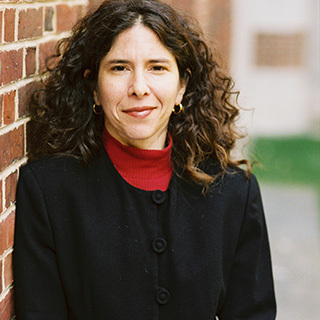 Barbara Mann is professor of cultural studies and Hebrew Literature and the Chana Kekst Professor of Jewish Literature at The Jewish Theological Seminary.